What are the Benefits of Café Barriers? 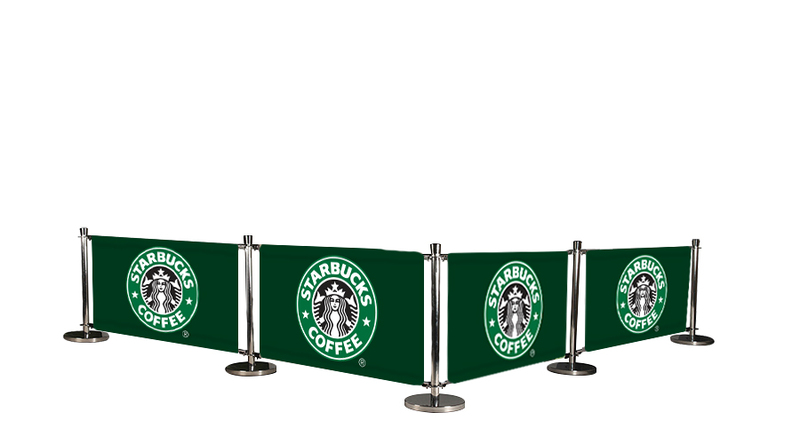 Our café barrier systems are perfect for extending your business outside and allow you to literally get your branding right out onto the street. Most people associate café barrier systems with eating and drinking outside during spring and summer. Whilst this is true, there is much more to a café barrier system, and they are suitable for many applications all year round. Our café barriers can be used both indoors and outdoors. Café barriers can be used to create designated eating, drinking or smoking areas for cafés, restaurants, coffee shops, bars and nightclubs. 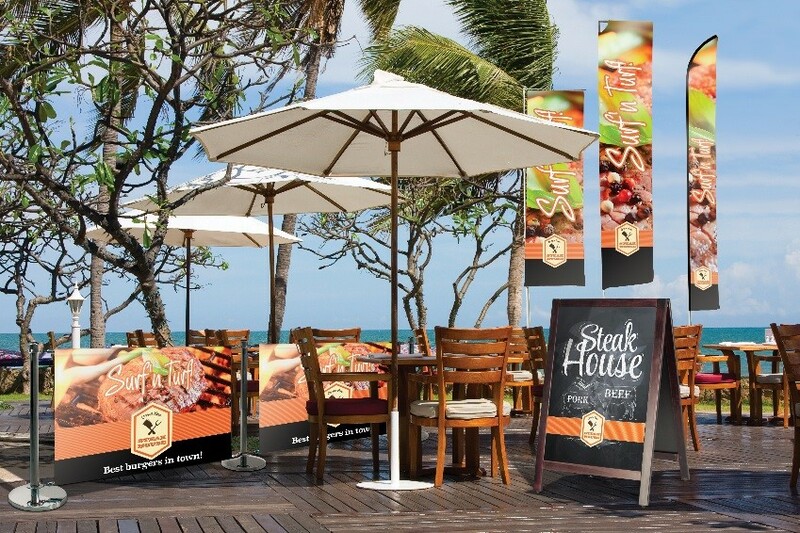 When used outside café banners can also act as a windbreak for outdoor areas. As well as allowing you to attract extra footfall, extend your businesses floor space and create a designated area, café barriers provide maximum advertising opportunity. The main benefit of any café barriers system is the additional advertising space to promote your brand. On a high street full of businesses it is easy for your shop front to get a little lost. The café barrier system not only allows you to extend your business floor space but provides a great opportunity for extra advertising. In the warmer months outdoor dining and drinking becomes hugely popular in the UK and there is much to be gained from this. Missing out on the opportunity to grab the extra footfall may mean your business rivals become the ‘place’ to go this summer. Having that extended area means you can create more table space and the café barrier system ensures people will notice it is there and that it belongs to your business. Although café barriers are perfect for creating an extended outdoor drinking and dining area they can be used indoors too. For example, canteens and cafeterias can benefit from a barrier system to clearly separate areas to eat, drink, rest and socialise. Gyms, health spas and sports centres usually have defined areas used for different purposes. Our café barrier systems are perfect for outlining which area is for what and provide a professional impact. Café barriers are ideal for defining seating areas or the bar within cafés, bars and restaurants, and can also be used within museums for promoting a particular artefact or display. Café barriers create a physical boundary for a specific area. This can greatly reduce the risk of pedestrians tripping or falling over your tables and chairs. Not only does it reduce the risk of possible accidents, but provides an enclosed area for your dining furniture minimising the risk of theft, damage or misuse. Although outside, your café barriers still act as a boundary for your business. Even though they cannot control customers, café barriers keep your dining furniture contained within your space. Café barriers can also act as directional signs and can be ideal for guiding people in a chosen direction. A café barrier system creates a visually appealing and well-organised look to what can sometimes be a hoard of unorganised tables and chairs. It creates a welcoming and professional look to your business and when branded with your business details its recognisable and will certainly attract customers. Our café barriers are sold as single components – post with base and printed banner – so you can tailor make a café barrier system to suit your space. To make things easier we also offer our café barrier systems in kit form so you can buy all you need in one go. These are available with 2, 3, 4 or 5 printed banners with posts and bases. We print your company logo or artwork onto either a PVC or display fabric café banner. Our Standard and Deluxe ranges offer a choice of banner widths. The Cafe Barrier System Deluxe 4 Banners is a popular choice as it has all you need to begin promoting your business outside. It includes 5 posts with 4 printed banners and gives an overall length of over six metres. For more information on our café barrier systems or any of our outdoor displays please contact us or call us on 01733 511030.